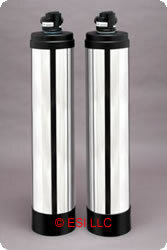 Salt Free Water Softeners and Activated Carbon Water Filtration Systems. No Salt Bags, No Resin, No Hassles and No Softeners Ban!!! Both models are complete and ready to install. Bypass valve included with choice of 1" CPVC, 3/4" copper or 1" copper connections. Note: Free Shipping by ground transport for lower 48 states. Iron, manganese and hydrogen sulfide must be removed prior to installation! Call 1-888-664-3336 for larger models. NoScale® media transform dissolved calcium (CaCO3) to a crystalline form. The crystals are relatively insoluble, effectively isolating hardness up to 25 grains/gal. (420 mg/L) from the water chemistry. A practical alternative to conventional water softening systems using salt or potassium chloride. These systems are designed to specifically tackle hard water problems with no salt or other regenerants, no backwash and no electricity. Long lasting media not consumed by the reactions. First Stage: Special blend of granular activated carbon filter for maximum removal of chlorine, chloramines (chlorine/ammonia disinfectant) bad taste and odor, THM's (chlorine by-products), PAH's (chloramines by-products) and carbon based volatile organic compounds (VOC's) such as pesticides, herbicides and industrial solvents. Filtered water from every faucet in your house. - NoScale® media treated water will feel noticeably smoother to your skin and hair.